Are you looking for something fun to make for Valentine's Day? 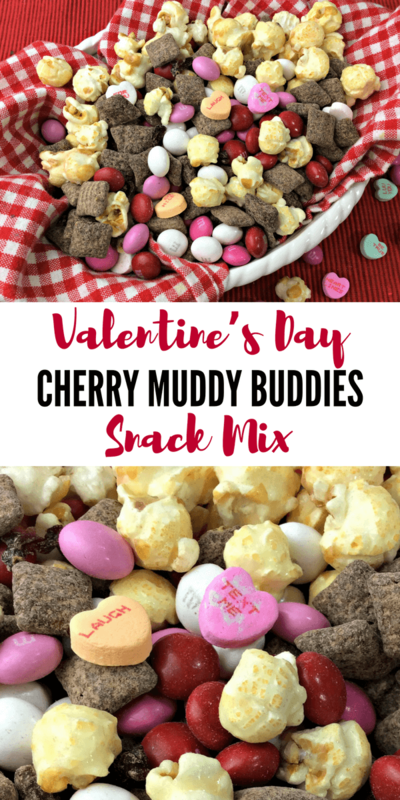 This Valentine's Day Cherry Muddy Buddies Snack Mix is awesome for the classroom or for you and your sweetie to snack on. This snack mix is also an excellent use for those cute Sweethearts Conversation Hearts candies that just scream Valentine's Day. Best of all, you make this Valentine's Day snack mix from scratch or you can use premade kettle corn as an easy shortcut. What better what to treat your loved ones this Valentine's Day than preparing a delicious treat for them? And, really, who can resist all the beautiful colors in this snack mix or the amazing flavor combo of chocolate and cherry? That is right. No one can. 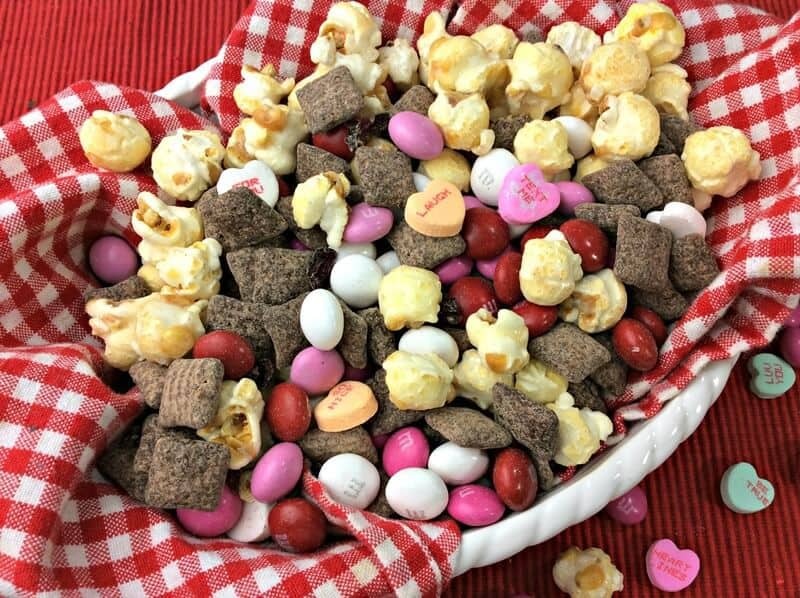 Be prepared to make this Valentine's Day Cherry Muddy Buddies Snack Mix a couple times. Yes, it's really that good! 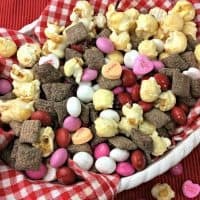 Also, this Valentine's Day Cherry Muddy Buddies Snack Mix would go great with a cup of Pink Velvet Hot Chocolate, so be sure to check out that recipe as well. 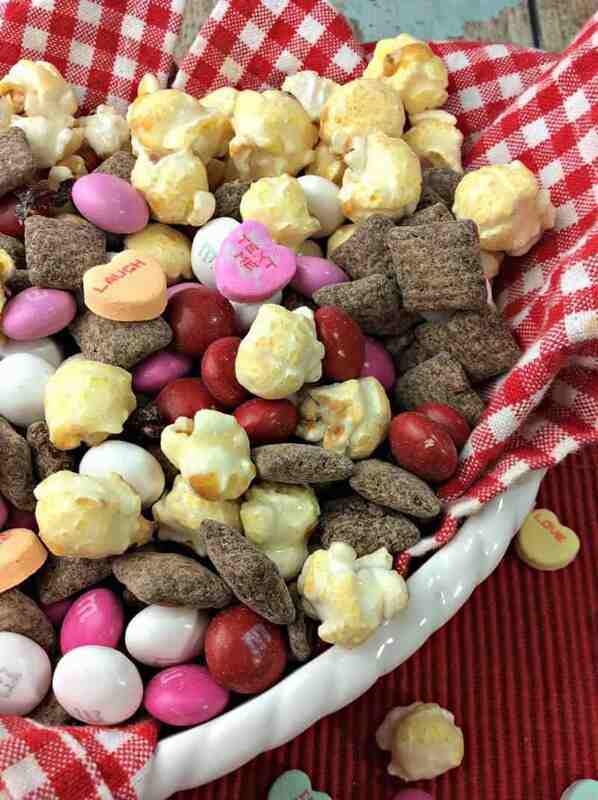 This Valentine's Day Cherry Muddy Buddies Snack Mix is awesome for the classroom or for you and your sweetie to snack on. Heat oil over medium-high heat in a heavy pan. Add 3 popcorn kernels to the oil, shaking pan every few seconds until the 3 kernels pop. Add sugar and stir constantly until it is close to dissolved, about 10-15 seconds. Quickly add ½ cup popcorn kernels and cover with lid. Shake pan five times and let rest for 2 seconds. Repeat until popping stops. Immediately pull pan off heat and pour popcorn into a large bowl. Toss with ¼ tsp. salt. If desired, add 1-2 Tbsp. melted butter and drizzle over the top for extra flavor. Set kettle corn aside to harden and cool. In a microwave-safe bowl, microwave the chocolate melts for 45 seconds. Remove from the microwave and stir. Continue to microwave in 10 second increments, stirring in-between, until chocolate is melted and smooth. In a large bowl, combine Chex and melted chocolate, stirring until all the Chex are completely coated. Use a large gallon sized ziploc baggie, add powdered sugar, cocoa and gelatin powder. Shake to mix. Add in the chocolate coated Chex and shake until fully coated. Store in covered container until ready to serve. In a large bowl combine Kettle corn, Cherry Muddy Buddies, M&M's, Dried cranberries, and Conversation heart candy. Add as much or little of each item as you like - there is no right or wrong here! Happy snackin' and have a very happy Valentine's Day! If you decide to give this Valentine's Day Cherry Muddy Buddies Snack Mix a try, let us know how you like it in the comments below! The cherry muddy buddies sounds like the best part of this! My oldest daughter loves the candy hearts, too, so I think I need to make this. I have always loved Valentine’s Day candy. When the holiday is over, I always buy up a bunch for later.